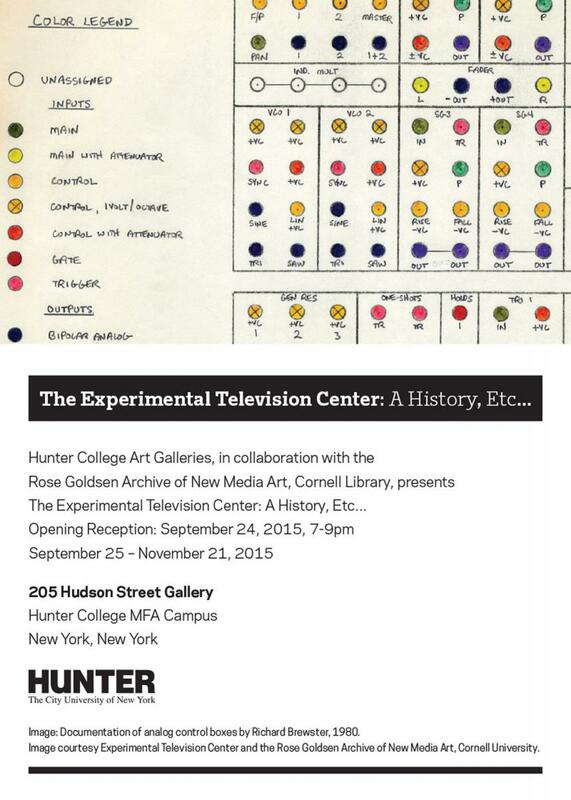 Organized by: Sarah Watson, Chief Curator of the Hunter College Art Galleries, Timothy Murray, Curator of the Rose Golden Archive of New Media Art, and Sherry Miller Hocking, Assistant Director of the Experimental Television Center. For over forty years, the Experimental Television Center (ETC) in Owego, New York, was one of North America’s preeminent organizations for video art, fostering a community for creativity and innovation through its residency and tool-building programs. The Experimental Television Center: A History, Etc . . . is the first academic survey of the Center’s prolific, yet under recognized role in the evolution of video art. Through works of art, ephemera, and video processing tools, this exhibition maps the ETC’s influence within the larger narrative of the history of video into the digital and internet age. From 1971 to 2011, over 1,500 artists participated in the ETC residency program, which functioned as a site for exploration, education, and practice for media artists. This exhibition spans works from the 1960s through the 2000s and also includes a collection of original analog instruments designed by artists/technologists, as well as two interactive installations featuring contemporary tools designed by Dave Jones, a long-time collaborator with ETC, and by Jason and Debora Bernagozzi, founders of the new media organization Signal Culture in Owego, New York. Benton C. Bainbridge, Perry Bard, Irit Batsry, Zoe Beloff, Kjell Bjørgeenen, Peer Bode, Nancy Buchanan, Barbara Buckner, Torsten Zenas Burns, Andrew Castrucci, Connie Coleman, Deana Crane, Renate Ferro, Raymond Ghirardo, Shalom Gorewitz, Alex Hahn, Barbara Hammer, Thomas Allen Harris, Liselot van der Heijden, Kathy High, Gary Hill, Ralph Hocking, Sherry Miller Hocking, Sara Hornbacher, Dave Jones, Philip Mallory Jones, John Knecht, Richard Kostelanetz, Shigeko Kubota, Hank Linhart, Jeanne Liotta, LoVid (Tali Hinkis and Kyle Lapidus), Kristin Lucas, Darrin Martin, Charlotte Moorman, NNeng-M (Benton C Bainbridge, Molly Kittle, Brian Moran, Nancy Meli Walker), Marisa Olson, Nam June Paik, Alan Powell, Daniel Reeves, Megan Roberts, Peter Rose, Eric Ross, Mary Ross, Lynne Sachs, Matt Schlanger, Caspar Stracke, Mark Street, Aldo Tambellini, Steina Vasulka, Woody Vasulka, Reynold Weidenaar, Walter Wright, Virgil Wong, Jud Yalkut, Arnie Zane. In 1971 Ralph Hocking, a professor in the Cinema Department at Binghamton University founded the Experimental Television Center out of his media-access organization Student Experiments in Television (SET). As the interest in video as an artistic medium gained momentum, the ETC provided access to and training in the use of this new technology to artists, interested citizens, and social, cultural, and educational organizations. Invested in pushing the boundaries of the video medium, the ETC developed a research program to create a more flexible set of processing tools for artists. Under the direction of artist Nam June Paik and video engineer Shuya Abe, a Paik/Abe Video Synthesizer was constructed for Center’s permanent use, which launched the ETC artist’s residency program. thank some of our many funders over the past forty years: New York State Council on the Arts, National Endowment for the Arts, Daniel Langlois Foundation for Art, Science, and Technology, the Andy Warhol Foundation, mediaThe foundation, and the Institute for Electronic Arts at Alfred University. The Experimental Television Center: A History, Etc. . . is made possible by the generous support of the Hunter Exhibition Fund; Arts Across the Curriculum Initiative, Hunter College; Ruth Stanton; the Rose Goldsen Archive of New Media Art and the Digitization and Conservation Services, Cornell Library; Society for the Humanities, Cornell University; the Experimental Television Center; New York State Council for the Humanities; Electronic Arts Intermix, Dave Jones Design and Signal Culture. The Hunter College Art Galleries, under the auspices of the Department of Art and Art History, have been a vital aspect of the New York cultural landscape since their inception over a quarter of a century ago. This exhibition builds on a long tradition of creative interchange between the disciplines of art history and studio art at Hunter. Widely regarded as one of the leading art programs in the country, Hunter College’s Department of Art and Art History serves both undergraduate and graduate students, offering an undergraduate major in Art, a BFA and an MFA in Studio Art, and an MA in Art History. In its 2012 rankings of “America’s Best Graduate Schools,” U.S. News & World Report ranked Hunter’s Master of Fine Arts program thirteenth and the painting and drawing program seventh in the nation.